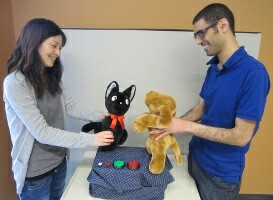 In this project we present a multi-part research project and evaluation of the style-by-demonstration (SBD) approach to creating interactive robot behaviors: enabling people to design the style of interactive robot behaviors by providing an exemplar. We present several projects in this vein: Puppet Dancer, teaching interactive dance to robots, Robotic Puppet Master, teaching interactive locomotion style to disc robots, and Animation Puppet Master, teaching paired behaviors to animated entities. We have conducted several studies through these projects, with the primary goal of building understanding of how people engage and use SBD systems. Download the Style by Demonstration for Interactive Robot Motion video file.